Fiction – novels, short stories, poetry, drama, children’s books. Note: You can choose to read a number of individual and uncollected short stories. In this case, 12 such stories would constitute one book. Individual poems do not count but books of poetry do. Non-fiction – memoirs, autobiographies, history and current events. If you intend to read mostly non-fiction, then please include at least one book of fiction. I’m not inclined to push any reading philosophy, I would however like to encourage participants to broaden their knowledge of African literature. For the novice, if you have not read any African lit or if you’ve read one book (E.g. Achebe’s Things Fall Apart): I would advise a mix of at least two regions, two languages, classic and contemporary, with both men and women writers. Books read in 2018 prior to this announcement which qualify for this challenge can count towards the 5-book requirement. Reviews of books read are not required but are encouraged, especially for those with blogs. Please link your reviews to this post. If you do not have a blog and would like to guest review on this blog, then please feel free to contact me. Some classic African literature can be hard to find. Please check your libraries and use inter-library loans if you have access to such services. I will publish lists of reading materials under various themes until I tire of the process. Please contact me at kinnareadsATgmailDOTcom if you need any help. You can subscribe to this blog (see top of the right sidebar) to stay updated on this challenge. That’s it. Let’s enjoy reading for the 2018 Africa Reading Challenge. 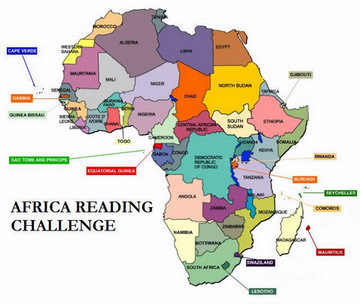 I have already done this, but I need to up the challenge to cover every region (North Africa, Southern Africa, East Africa, West Africa and Central Africa), not just North & West which is my habitual reading. Very late to the party but I’m in. 5 is good. I live in Nigeria home to Farafina books who graciously churn out books by African Writers at affordable prices. Already I have read this year 1) The Carnivorous City by Toni Kan 2)After Many Days by Jowhor Ile and 3)What It Means When a Man Falls from the Sky by Lesley Nneka Arimah. Up next Welcome to Lagos by Chibundu Onuzo and The Woman Next Door by Yewande Omotosho. These among the huge TBR pile of mostly Nigerian authors that are easy to buy here. The Challenge for me would be reading books by African authors not of Nigerian decent. So I’m hoping to purchase a few in this 2nd half of the year and will update. Unfortunately laziness refuses to give room for reviews. I can participate in discussions though. Enjoy reading everyone and thanks for the challenge Kinna! Anyway, here we are in May and I have read more than five books already, which is a testament to the richness of African writing, eh? I’ve read Petals of Blood and The River Between by Ngugi wa Thiong’o (Kenya); The Woman Next Door by Yewande Omotoso (SA); A Dry White Season by Andre Brink (SA); Beyond the Rice Fields by Naivo (Madagascar); some of a collection called Africa 39 (stories from south of the Sahara, and I read the ones from countries I’d never read before); Songs of a War Boy by Deng Thiank Adut (NF, a memoir from Southern Sudan); and Season of Migration to the North by Tayeb Sali (Sudan). So pleased to see this is still going (from strength to strength) as I have been a bit absent from the blogging world the past 2 years. I didn’t sign up for this challenge last year & as a result only read three books – sigh. In my defence, I was studying + full time work. I read Songs of Enchantment and Infinite Riches by Ben Okri, to finish the Famished Road Trilogy, and they were awesome in the original sense of the word. I also read Nadine Gordimer’s Get a Life, but not so impressed with that, although I have liked other work by her. Mighty be our powers – Leymah Gbowee. They’ve all been excellent reads. Will invite my friends to participate as I’m sure they would love this. This is deliciously exciting! Signing up. Signing up for this. My ambtion for 2018 is to read primarily books by African writers – classic and contemporary. I started the year with “Stay with me” by Ayobami Adebayo. i’m in, i already read Efuru by Flora Nwapa, The girl from abroad by Samuel Kahiga and i’m currently reading Simbi and the satyr of the dark jungle by Amos Tutuola. I plan on reading one book from central Africa and another one from south Africa but i don’t know yet which author i’ll be choosing even if Bessie Head ‘s been on my mind for quite a moment and JJ Bola’s debut is on my tar. I will certainly write a post on my blog later. Count me in! This will be my first time as well as my first time hearing about this Challenge. This will broaden my reading and that’s super exciting, especially since I had my first trip to Africa & South Africa last year. I’d love to sign up for this and I’ll try to read regions I haven’t read before. I’m in again, Kinna. Thanks for hosting! I really enjoyed the books I read for last year’s challenge, and I was late starting into that stack last year, so I’m hoping to get this habit to really stick this year. Bryan I would recommend Leila Aboulela’s “The Kindness of Enemies”. I am joining it, big time! #MozUp! I must make a better showing with this challenge this year. I certainly have acquired a lot more African books over the past year. I am reading Ngugi wa Thiong’o at the moment—a writer I have always meant to read. I am going to India next month for a visit to a publisher and Ngugi is scheduled to be there for a week while I’m there! That should be cool. Definitely down to do this!